The Tokyo Disney Resort Line is open, and it's quite different than its cousin systems at Disneyland, California and Walt Disney World in Florida. To start with, look at this conductor's uniform. 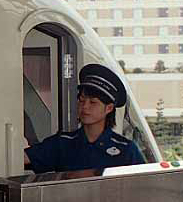 We haven't seen hats like this on Disney monorail drivers since the 1960's. It's nice to see they are back. Now let's take a look at the trains at various places along the 4.8 km loop line. Our thanks to an anonymous photographer for these three pages of wonderful pictures! 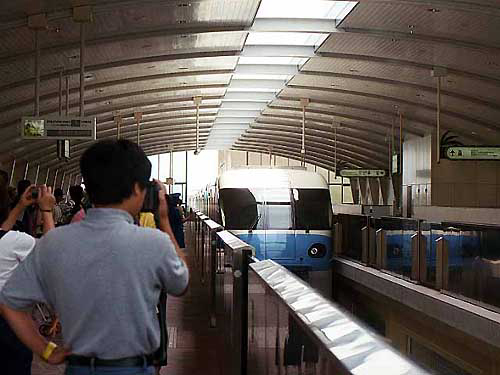 Cameras fire as Monorail Blue arrives at Gateway Station. 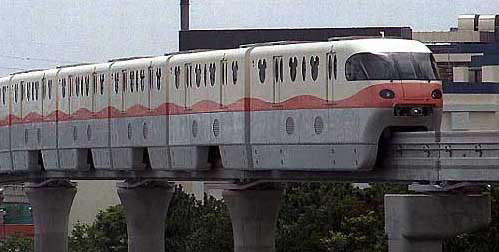 Monorail Pink heads between Gateway Station and Tokyo Disneyland Station. 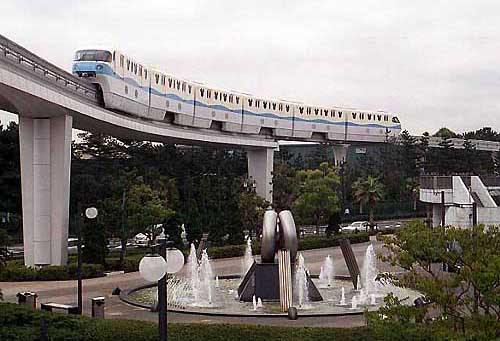 Monorail Blue crosses unique long span as it curves its way to Disneyland Station, as seen from JR Maihama Rail Station. Continuing the descent as the track wraps around the Tokyo Disneyland park perimeter.